We're coming off a character win against a good team like Maccabi. Everyone knows it is always tough playing against Maccabi in Tel Aviv, especially since they were on a seven-game winning streak at home. It was a crucial game for both sides. Maccabi is in the playoffs run, trying to make it to the next round, and we are protecting our fourth place and still mathematically fighting to lock up a playoffs spot, too. We came out playing with a lot of confidence and dedication in front of a nice crowd. In that sense, it is always great to play in Tel Aviv, because a great crowd is guaranteed in each of its home games. We had some ups and downs in the game, but definitely made less mistakes in the second half. That gave us the lead and we ended up going back home with a nice road victory. Before that, we beat FC Barcelona in a key game in the fight for the fourth place, and the potential home-court advantage in the playoffs. Did you watch that game? Shane Larkin was just unstoppable. At some points, it looked like he couldn't miss! He made it look easy, but it is never easy to do that, especially at the EuroLeague level. I can say that Larkin's performance against Barcelona was one of the best individual performances I have witnessed thus far. Not only did he make great plays, he also provided very entertaining moments throughout the game and made all of our fans feel involved in his great performance. "We want to be ambitious, keep winning, and defend fourth place." I have to say I am very happy for him. He has been a tremendous teammate. Very outgoing, funny, energetic and a sincere guy. Obviously, expectations were too high on him. He had ups and downs in his game and, unfortunately, he had to deal with small injuries in the beginning of the season. For that reason, it wasn't easy for him to catch his rhythm. We, his teammates and our coaching staff, never doubted his potential and had full confidence on him. We knew what he was capable of doing all season. So, him playing so well lately is not a surprise to us. Like I said, we are almost in the playoffs, not mathematically yet, but almost. Our next win – or losses by other teams – should send us to the playoffs soon, but that doesn't mean we are stopping. We want to be ambitious, to keep winning, and to defend fourth place. Last season was one of those years that we don't want to remember as a club. We only just seven wins and were at the bottom of the standings. This year, things are going well, the way want. We are taking strong steps towards our goals and that determination is one of the keys to a good season. Above all, we are working hard to please our fans. This is a great reward for them after being there for us for many years, waiting for this moment. This year, our fans have been very loyal to us. I know for a fact that some of the fan groups have been supporting us since the club won the Korac Cup in 1996 – and even before that! I am pretty sure that the hustle we put on the court makes them happy, as well as winning games. As a team, we feel more motivated and energetic when we feel the support of our fans at Sinan Erdem Arena. Playing with two great point guards and new teammates, I am having the chance to get better. As an athlete, you always have to try to get better, and having Shane and Vasilije Micic on the team is an opportunity for me. I have played along with many great players throughout my career. I always believe that there is no age limit for learning. And at age 30, I am still willing to learn new things. I have learned a lot from my former teammates and coaches, and am still learning from these two guys as well. It is not just the work you do on the court, but also off the court: studying opponents at home, watching their moves, and so on. It is very important knowing what to expect from your opponent coming into the game. Therefore, its very significant to scout each player and study them before, so you can know what you will have to face during the game. Its just like studying for an exam. The more material you know, the better chances for you to make good grades! "Stay humble should be our motto, all year long." Our next game is at home against CSKA Moscow. It is always special to face such big team at home. We definitely have to take advantage of playing in front of our own crowd against CSKA. I believe our fans will support us all game long. 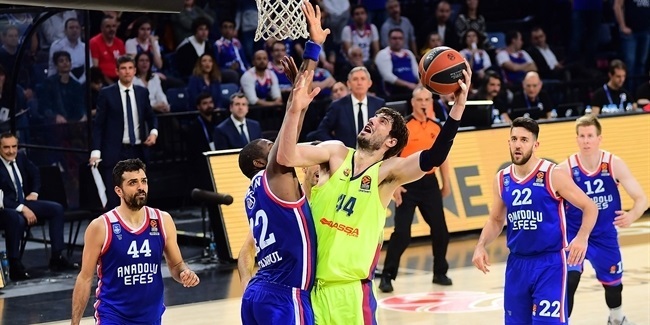 No question, CSKA will be much more motivated to win this game, especially after losing their last game at home on a buzzer-beater by Nick Calathes. We just have to play our game and stick to our game plan. 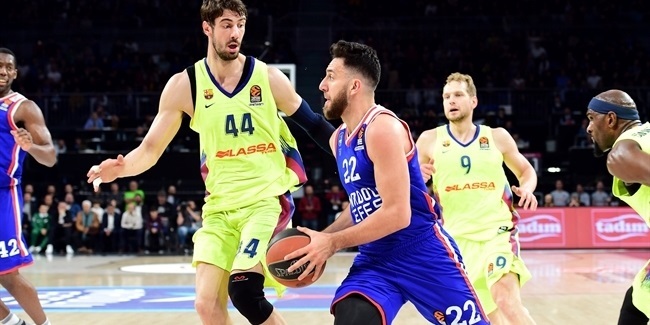 Of course, it will not be easy to play against Nando De Colo and Sergio Rodriguez. It is unfortunate for all the other EuroLeague teams that this duo is competing on the same team (just kidding!) Both are big threats for any team. It is always hard to defend them and it will be a big challenge for us, but as long as we play our team defense, I believe we will find the way to stop them. So first, we have to qualify to the playoffs, make it official, and keep working hard. Stay humble should be our motto, all year long. We should never be satisfied with what we accomplished and should always focus on the next move – and stay focused until we reach our goals. We have to take one game at a time and our next home will be against CSKA, in front of thousands of Efes fans cheering for us. Playing in a sold-out arena is always fun. 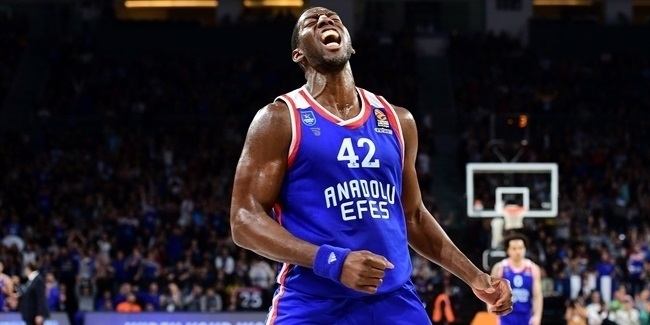 I hope to see the Efes supporters filling up Sinan Erdem Arena on Tuesday. We are better and stronger with your support!